The great American hamburger is a myth. In my book it’s a dream meal that never quite materializes. To reach the ideal, the burger must have a toasted, light bun, not too sweet or doughy; the meat, pristine beef, medium rare, richly charred over a hardwood fire; a crumble of melting blue cheese; a slice of garden-ripened tomato; pickled red onions; a spoonful of spicy homemade ketchup; a smear of Dijon mustard and a few leaves of fresh basil or soft butter lettuce. Plus it must be HOT. By the time all the parts are assembled, I’m ready to walk away, settle for a salad, and again try to make the myth real next year. This Labor Day’s focus will be the buns. If they were just for me, I’d choose chunks of crusty baguettes, but with a crew of kiddies to please, we’ll have traditional burger buns, and they’ll be homemade. The dough is the easy part, but the shaping is tricky. I’ve tried rolling out the dough and stamping wide biscuit-like circles, but the results are uneven. It’s better to ball-shape each nugget of dough as described in the recipe. 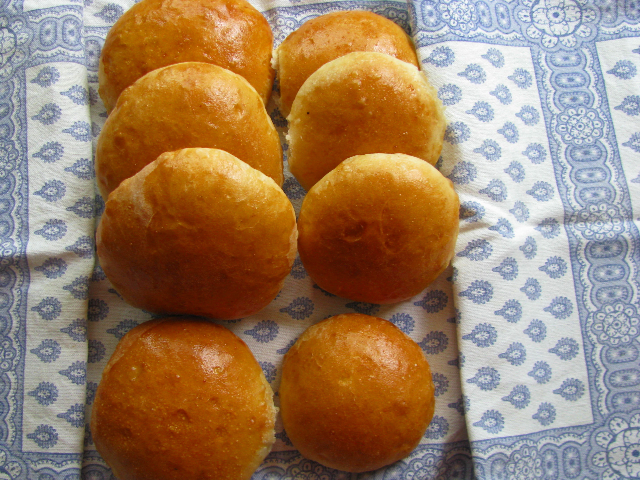 Golden from the egg-wash glaze, gently browned and feather-light, a bag of these buns may be kept in your freezer for burgers on picnic holidays or weekday suppers throughout the year. * Water: Never cook with hot tap water, which may contain unwanted chemicals sitting in the hot water heater. Always start with cold tap water and warm it for use. ** A reliable scale is a home baker’s best friend. Measurements are always quick and accurate. Add a pinch of ginger to the lukewarm water in a mixing bowl and sprinkle over the dry yeast. Allow the yeast to soften a few minutes. Add sugar, oil, wheat germ. Beat the egg in a small cup. Remove 1 tablespoon for the egg-wash and add the rest of the egg to the mixture. Stir in the flour, sprinkle over the salt. Cover bowl with a towel and allow it to rest at least 10 minutes. If using a stand mixer with a dough hook, knead in the bowl for 10 minutes. If kneading by hand, scrape the dough onto a lightly floured surface and knead 10 minutes. Work the dough with a drawing-up and pulling-over motion, using both hands. Keep the dough soft, trying not to add extra flour. The dough will grow satiny but may seem a bit sticky. Use a flat-edged scraper to lift the dough. Only very soft dough will give feather-light buns. Cover the kneaded dough and allow it to rise 1½ hours. Release the dough from the edges of the bowl, gently fold it over to deflate, cover and allow it to rise for 30 minutes more. 2-oz. pieces. Shape each piece into a mini-ball. The technique needed here is to maintain the smooth surface tension of the dough, pulling the cut edges together and pinching them underneath. Cup each ball of dough in your hand with the pinched-together area on the bottom. Roll the ball gently on the countertop to seal the bottom and make the top even. Place each ball on the cookie sheet. Once all the balls are placed 3 inches apart from one another on 1 or 2 baking tins, cover the balls with a sheet of lightly oiled plastic wrap and flatten each ball to a half-inch thickness with the palm of your hand. Cover with a tea towel and allow the buns to rise for about 30 minutes. Preheat the oven to 425º, brush the top of each bun lightly with the reserved beaten egg (use a damp pastry brush or your fingertips ever so gently) and bake for 10 to 12 minutes or until golden brown. Makes 10 3-oz. buns or 15 2-oz. buns.